In its final days before crashing into the surface of the moon on June 11, Japan's KAGUYA explorer has been shooting high-definition footage of the lunar terrain from low altitude. The Japan Aerospace Exploration Agency (JAXA), which operates the HD camera-equipped probe along with public broadcaster NHK, has uploaded two videos on YouTube. The first video (embedded above) was shot from an altitude of about 11 kilometers (7 miles) up, at between 45 and 52 degrees south latitude and 262 and 263 degrees east longitude. The second video, which offers a view of the Antoniadi lunar crater, was shot from an altitude of about 21 kilometers (13 miles) up, at between 64 and 70 degrees south latitude and 186 and 188 degrees east longitude. After its launch in late 2007, KAGUYA started in orbit about 100 kilometers (62 miles) above the moon. In February 2009 the probe dropped to an altitude of 50 kilometers (31 miles), and in April it dropped to between 10 and 30 kilometers (6 - 19 miles). The KAGUYA probe will end its scientific exploration of the moon with a controlled impact on the lunar surface. 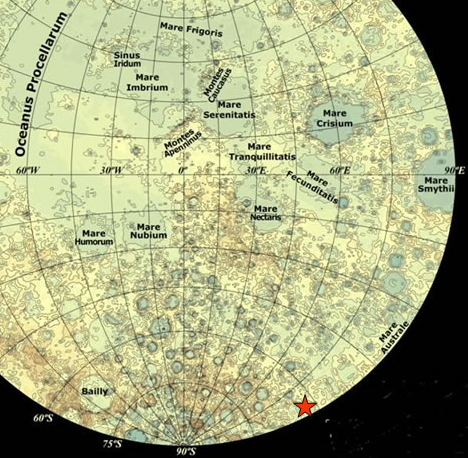 The crash, scheduled for 3:30 AM (Japan standard time) on June 11, 2009 (6:30 PM GMT on June 10, 2009), will occur in the shadow on the near side of the moon, at 63 degrees south latitude and 80 degrees east longitude. JAXA has not announced whether the probe will film its own demise. Of course it wouldn't silence the conspiracy nuts, since both the video and the left behind gear could be faked without putting men on the moon. But then again... there's no way to convince a conspiracy nut that he's wrong anyway. The reverse logic also works here. I think there's an equal portion of reasoned people out there that would love confirmation either way. A competing country would offer answers that many would accept. So, yes, bring on "confirmation". When we see it, we'll believe it. Personally, I think there was a cold war incentive to "bend" the truth about the Apollo program. We may have gone but not with the frequency they claimed. You really have to ask yourself why it has become such a monumental task to go back, when they did it with such grace and speed in a relatively primitive technological age. Something has always stunk about the Apollo program and I think there is a subconscious knowing that causes everyone to wonder (even if the questioning is counter to the supposed truths). They did search but did not find any evidence of the apollo 11 landing site. I suppose WWII didn't happen because you weren't there. I could go on and on about everyday history that you accept without question. Maybe it's not 100% correct, but the core truth is there. Read some books by the people that where there and stop spreading misinformation about the moon program. It isn't fun, it's just stupid. Men died during the Apollo program so men could walk on the moon. You defile their memory. Shame on you. No one said it "didn't happen" or that people didn't die during the long run of the program. What I'm saying is that there is some good evidence that NASA stretched the truth regarding the true scope of the program. Cold war motivations placed them in a position where they had to at least appear to have the upper hand in the space race. They most certainly went to the moon, the question is how many times did they actually make the full trip. There are far too many anomalies (beyond the knee-jerk fringe crap) to simply dismiss the unusual nature of what happened during those years. You can be a historical loyalist if you want but history is rarely what it appears to be on paper. Conspiracy theories aside, I can't find words enough to express how cool these 2 videos are.